Christina and I welcome you to our weekly challenge. 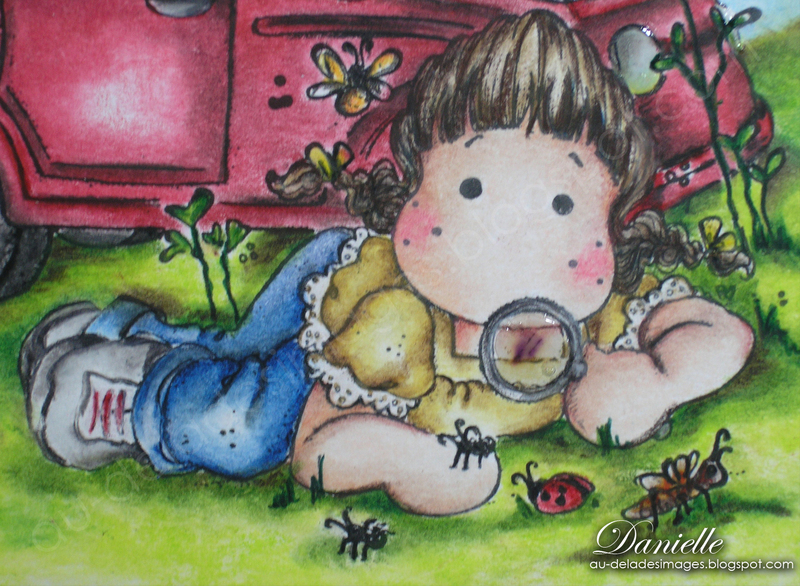 This week, the theme is Adorable Bugs. My favourite bug is the ladybug. There is a long story associated with my love for this cute bug, and it has to do with my youngest son. He is now a man, but I still can't resist buying anyting that has a ladybug! Cette semaine ma bonne amie Christina et moi, avons comme thème "Bébite adorable", mon mari n'approuverait certainement pas cette traduction, mais elle est appropriée! J,ai une longue histoire d'amour avec les coccinelles, directement associée à mon plus jeune fils. Encore aujourd'hui je résiste difficilement à tout objet ou image avec une coccinelle. I have chosen Explore Tilda for my card, who has decided to go for a ride in her car. I used Tilda's car, unable to find a suitable image of a Volkswagen beetle! However, it does look a little bit like it! 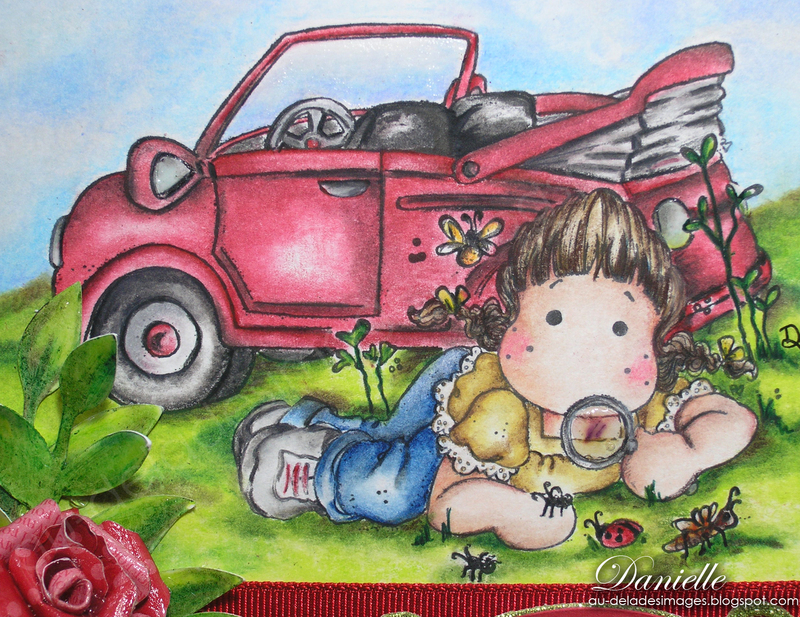 Tilda and the car are stamped with Versafine on Strathmore Bristol paper, and colored with crayons... The inspiration of this card came from a blogger friend, I admire very much, Claudia, I invite you to visit her, if you have not already did; since the car is so big, I was unable to print it on a proper sized shape giving me enough room to play with Tilda. 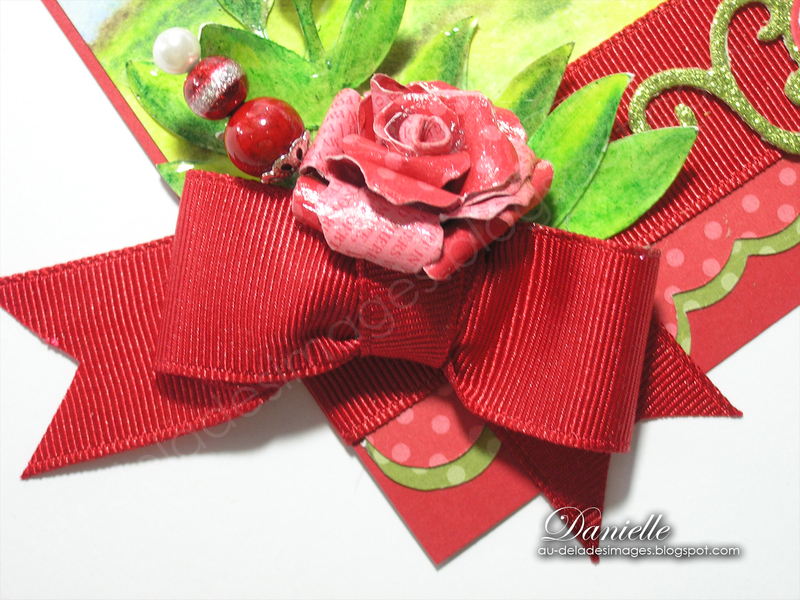 So, I decided the scenery would be the card, and I would add embellishments.The flower and the stickpin are handmade. I received those magnificient corners from my dear Chritina ( Thank you so much). J'ai étampé Explore Tilda ainsi que la voiture sur papier Bristol, en me servant de la technique du masque. Je me suis inspirée d'une amie bloggeuse que j'admire beaucoup Claudia, que je vous invìte à visiter, elle vous inspirera, ses cartes sont de petits bijoux. Étant donné que la voiture occupe beaucoup d'espace, j,ai pensé que la scène entière occuperait le haut de la carte, sans plus. Je décorerais le bas de l'image. Voilà! J,ai étampé mon image sur Bristol, elle est coloriée avec du crayon et estompé avec de la Taltine. J'ai fait moi-même la fleur que j'ai recouverte de Glossy accent; l'épingle à chapeau est faite avec des perles de mon inventaire; l'étiquette de spellbinders; pour le sentiment, je me suis inspirée d'un ensemble de Nicole Verkooden, sheet 101, puisque j'avais besoin d'une forme ovale, j'ai imprimé au moyen de l'imprimante. La bordure ainsique les feuillages sont coupées avec ma cricut expression. Les magnifiques coins sont un présent de Christina. I would like to invite you to visit my very talented friends and teamates, Christina and Cathy Lynn; Rene is on vacation this week. Next week our theme will be a "recipe card". J,aimerais vous inviter à visiter mes amies et compagnes d'équipe, Christina et Cathy Lynn, cette semaine Rene est en vacances. La semaine prochaine, notre thème sera "une recette". I have entered my card in the TOMIC Challenge No. 3, Summer and in the Make it colourful No. 23, colour cast reflection. Beautiful card Danielle, gorgeous colouring and fabulous images. Oh my goodness Danielle this is FABULOUS!!!! What a clever scene you've created and colored brilliantly. Tilda has definitely spotted your favorite ladybug. Your flower and stick pin are beautiful as well as your other details. I love this!!! Wow, Hon, your coloring is SPECTACULAR!!!!! Love this wonderful scene you created for Tilda. Your handmade flower is beautiful. A gorgeous creation!!!!! Great card, it's so special! Wow this is really a spectacular card. I love it very much. Hey Sweet Pea! You are indeed the Queen of Design when it comes to scene with a story cards. No words necessary. A picture is worth a thousand words. This design dances!! The Tilda you have used is one of my favorites and reminds me of one of my granddaughters. Those corner embellishment are fantastic and oddly enough look like elegant bugs. See their little eyes poking up over their red noses! The coloring is out of the world - to die for perfect. You do well with a lot of different mediums. This color is so rich - like a good cup of coffee rich. For me, this is one perfect card. The design, the subject matter, the rich colors - I love it!! OH!!! I forgot something. Your flower is gorgeous. I love homemade flowers most of all. Beautiful work Danielle!! Quelle scène!! Vraiment merveilleuse cette carte! Fabulous card, Great job on the coloring and your flower is spectacular really stands out. Beautiful card Danielle! Love how you incorporated the two images together. Your coloring is wonderful. Oh my this is so stunning Danielle! Love your sweet scene and beautiful colouring! OH-MY-GOSH!!! Your scenery is INCREDIBLY GORGEOUS!!!! Ohhhh I can just imagine Tilda taking a long drive out into the country somewhere to just be with nature and she finds all these wonderful little critters to observe! Your colouring is simply WONDERFUL and that sky ... ooooh .. just BEAUTIFUL! This is amazing Danielle!!!! Beautiful card! I love the images chosen and your layout constructs the scene perfectly. Gorgeous colouring too! Excellent job. Your card is gorgeous! Adorable card. The scene just has a way of taking you in! Tres jolie! J'adore le coleur de rose. L'automobile est too cute. I run out of my French again. lol But it is a lovely card. 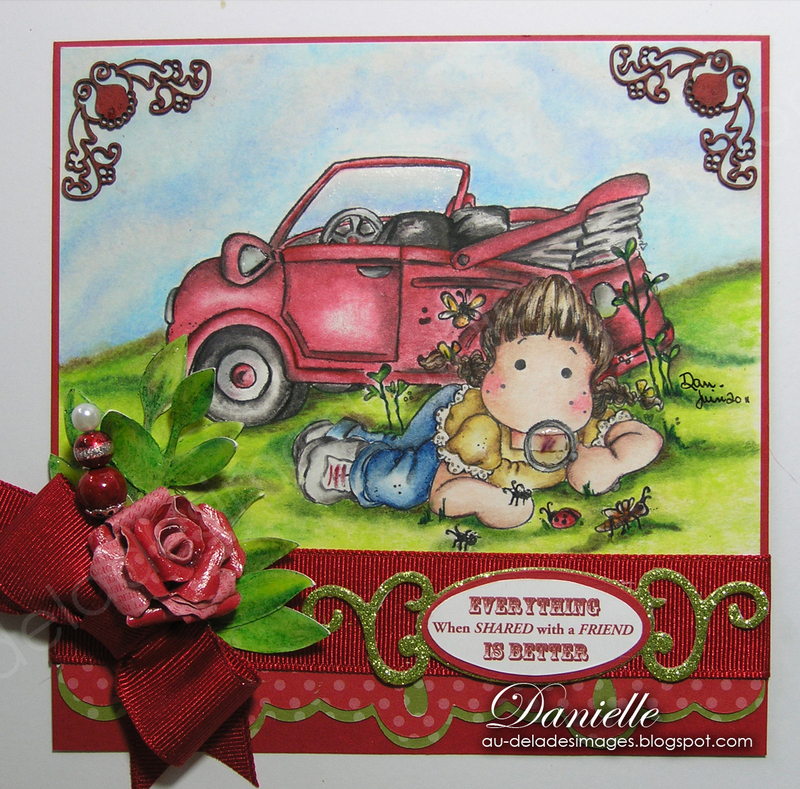 I love your super cute & FUN card, Danielle! Nicely done & so colorful & summery! Elle est superbe ta carte, j'adore ton agencement avec la petite Tilda et sa voiture. Bravo! WOW!! What a clever way to create the perfect background! Tilda is really enjoying her bug expedition. Beautiful job coloring. oh i looove your cards. how sweet and of course all the coloring you have done. i can not wait until i get my new sentiment set from Nicole! Wow Danielle! This is a very pretty scene you created! Perfect with Tilda's car and her exploring! Your coloring is wonderful and I love everything about this card! So imaginative!